I’m leading an event tomorrow. I’m equal parts excited and nervous. I’m going to lead a meditation on the south lawn of the Nelson Museum. I’m going to give a little guidance and then we’re going to sit and meditate together. This is about taking practice out into the world instead of keeping it hidden. It’s about bringing some positivity and awareness into the world. Too often we see the world (and each other) as isolated and indifferent instead of connected and open hearted. Let’s see if we can work on that. It’s Meditation Day and several other cities are hosting events like this. This event (and others) will be live-streamed on The Tattooed Buddha. So you should go “like” that page on Facebook. Some would argue that, when leading an event like this, the best thing to do is to pretend to completely confident. Act like you believe everything will work out great. Don’t show a single sign of weakness. That’s not how I do things. I am not the confident teacher who sits above you on a throne, who you can look up to. And I don’t want to be that. I’m the teacher who’s down on the floor with you and struggles with a lot of the same crap. I think, as a teacher, I want to be completely open and I don’t want to fake anything. To me the Buddhist path is all about becoming more and more open and genuine and showing that as completely as I can. So, I’m here to tell you that I’m nervous. I’m carrying these questions around with me and they’re stealing a little bit of my joy. How often do we carry negative “What if” questions that steal our joy? We struggle with questions like these all time. Some of us struggle a lot. Some of us struggle only a little. It’s a part of human life and it seems inescapable. But I have a larger point. What we’re trying to do in our meditation practice is to learn how to put down some of the questions we’re carrying. There might be questions that are good, “What if I’m too tired to drive?”, and these questions are very useful. I don’t want to say all questions are bad, that’s certainly not the case. But these questions I’m asking myself about this event tomorrow are useless. What if no one comes? Well, I’ll still be live streaming the meditation and thousands of people will watch it. What if it rains? Then we’ll go inside. What if I don’t do a good job? Well, it’s not about me. It’s about the practice. And the practice is good. I can answer all those questions but that doesn’t make them disappear. There’s still a low level anxiety that’s going to have an impact on me. The questions are a little softer, a little less loud. Once in a while someone asks me why I don’t do more public events like this. It’s mainly because I’m asking myself questions like those above. And sometimes the baggage is hard to put down. Sometimes it’s about putting down our baggage. Sometimes the best we can do is figure out how to make our baggage a little lighter. We are going to meet up on the south lawn of the Nelson Museum for some public meditation. I’ll give a very short talk and then a bit of guidance and we will sit together. There are a few things people often say in casual conversation when they find out that I meditate. I want to be very clear, this is what gets said in general conversation, not in a teaching context. “That’s so cool. I wish I could calm my mind down, but I can’t,” or some other version of wishing they could do it (because they think it’s easy for me, of course). Because that’s the answer. You have time for what you make time for. If someone says they don’t have time to meditate, I do not believe them. I’m not going to lie to you. I’ve “fallen off the cushion” many times. I’m a normal person like you. I know that I should meditate every day, and I just don’t do it. There was a time when I did, and then I stopped for a while and then I started again. And then I stopped for a while. Because the truth is, it is really easy to not meditate. We have ten million distractions around us all the time. But, if you don’t think you have time to meditate….you’re wrong. You don’t have to dedicate an hour to the practice. Or even half an hour. Even simply sitting for five minutes a day can bring enormous benefit. Or, if that’s too hard, even once a week. The point is regularity. “This is when I do it and I always do it” matters a whole lot more than doing it a long time. When I first started practicing, many years ago, I would just meditate when I felt like it. When the idea came to me to do it, I would do it. That, of course, led to not doing it very often. The thing is this, meditation is like any other thing that we’re trying to get better at. It’s just like going to the gym, or practicing guitar. You don’t just get it right away, and you don’t get better unless you practice over and over and over. So, the important thing is routine. A few things have worked for me—one worked for a while and I’m glad it did, but it didn’t work forever and ended up easy to lose track of. That was putting it into my morning routine. Get up, go to the bathroom, take a shower, shave (this was before I had a beard), meditate, eat breakfast, go. That was what I started doing many years ago, when I was a young, a college student. Long before the kids and the divorces and the career and the writing. You see, I started meditating before I had ever met another meditator. I didn’t want to do it in a group. I’m pretty introverted and quiet a lot of the time and I didn’t know anyone with this interest. So I quietly practiced on my own. And that worked for a really long time. After the kids were around, I tried to set up a nighttime one too, shortly before bed. I just remember my son getting out of bed and coming to sit with me. And my daughter bounding after him. Some people think kids can’t meditate. Those people are wrong. That was a different world though. Distractions seem to be more powerful now. I don’t know if the distractions are getting stronger or if I’m getting weaker. But that was in the days before I even had a phone, let alone a magical box that could tell me anything in the universe. We have millions of ways to kill time and I wonder if we’re happier. I don’t meditate every morning, but sometimes I think I should. I could lie to you and say that I do (you’re not going to fact check this). But I want to be real. I want to see the realest thing I’ve ever written and be even more real. Over the years sitting as part of my morning routine got harder and harder to do. That’s the truth. I don’t know why; I can’t explain it. It just got harder. Here’s the other thing that works. And you may not be able to do it, depending on where you live: Find a friend. Just like how going to the gym is easier with a workout buddy, meditation is easier when you aren’t doing it alone. I lead a live online meditation group once a week through Daily Dharma Gathering. Because I lead the group, I have to participate, obviously (I can tell you I’ve learned a lot more from teaching than I ever thought I would) and I go to a Wednesday night meditation group. That’s where the core of my practice is these days—sitting with other people. That is what I recommend, above all other things. Now, some of you might live in rural areas or something, but an overwhelming majority of the people reading this live 30 minutes or less from a Buddhist temple or meditation center. They’re everywhere. And, look, there are things I really don’t like about Tibetan style Buddhism, but I still practiced in a Tibetan Buddhist temple for years because it was a place to go. I was able to ignore the bowing and chanting and other things that I think are nonsense. So it doesn’t even matter if the place around you isn’t exactly what you want. The point is there’s a place to go sit. And if there are several around (there probably are) check them all out. Find the one you think is the best for you. I think there’s something about our minds. Going out and doing it makes it more meaningful to us, or easier to stick with, somehow. There’s a special thing about meditating in a group. If I’m meditating by myself and I sneak a look at my phone or whatever, or stop the meditation early because I feel like it, no one knows. There’s no one to hold me accountable. But if I’m meditating in a group…there’s an element of peer pressure there. Shame is a great motivator. I can’t just check my phone during a meditation if I’m surrounded by people that are meditating. That’s embarrassing. There’s one other option and that seems a little more daunting— starting a group of your own. You don’t need money to rent a place. You can do it in your living room or in a park or something. And, of course, at least one friend who’s dedicated to doing it with you. For a while I meditated on my breaks at work too. People gave me the weirdest looks. I’m not sure I can recommend that one. So, there you have it. If you truly want to meditate, make it part of your daily routine. If you want to stick with it, find a group to meditate with or a place that offers regular sittings. It’s said that the lineage that we call Zen started in a place called Vulture Peak. It’s said that it started when the Buddha was silent, in the space between words—it was the teaching of no-teaching. His students asked for a teaching, as they did many times. Instead of speaking, as they expected, he just raised a flower. It was a white lotus and he just held it up and showed it to everyone. The symbol of the Zen tradition is the Enso, an empty circle drawn with a brushstroke. I humbly suggest that the symbol should be a flower instead. All of the assembled students were just confused and disappointed, as we can imagine we would be, except for one. His name was Mahakasyapa. The point is usually said to be that the dharma isn’t something you hear or read. It’s experiencing this moment as it is, purely and directly. Everyone else was waiting for some great philosophical teaching. Mahakasyapa just sat there and experienced the Buddha raising a flower. At this point, the Buddha declared that Mahakasyapa was his chosen successor, that he had attained enlightenment just as the Buddha himself had. Mahakasyapa was an important historical figure. He convened the first council after the Buddha’s death, where everyone got together to recite and share the Buddha’s teachings that they had memorized. In Theravada temples he’s sometimes depicted in art hanging around with Ananda, the Buddha’s cousin and attendant. If it is then the Zen lineage passed through 27 teachers without anyone really talking about it, until Bodhidharma took the lineage to China and replanted it, where it then changed a little to become more like the nature religions of Taoism and Confucianism (as Buddhism often does when it enters new cultures). There were Buddhists who traveled to China to spread the teachings of the Lankavatara Sutra. In those days that was really how different groups of Buddhists defined themselves. They didn’t have rigid lineages like the ones that exist now. It’s said that the Lankavatara Sutra is the one that Bodhidharma brought with him. Once these Buddhists arrived they encountered resistance. They learned from the Buddhist sects that had already formed in China: Huayan, Tiantai and Pure Land. In these sects different things became emphasized to make the teachings more acceptable to Chinese culture. A history was created to embody authenticity—not fabrication, mythmaking. Fabrication implies negative or selfish intent. We might view mythmaking as lying in the modern world, but only if we don’t realize that expecting stories to be literally true is a new idea. Things can be meaningful by being true in a non-literal sense and that’s how things have been throughout much of human history. It could be argued that the Zen tradition formed in response to those other forms, as an effort to create a Chinese form of Buddhism that was more in line with the Buddha’s original teaching. Pure Land, with it’s chanting and wishing for rebirth in heaven, and Tiantai, with it’s focus on secret and mysterious teachings, seem very different from the Buddha’s three simple trainings. Huayan is the closest, and it’s easy to see how much it influenced the Zen tradition. Huayan, inspired by the Avatamsaka Sutra, is known for being a little more philosophical, mystical, and positive than Zen. Zen is known for being more down to earth. I think those lines are very blurry. If you look for philosophical and hard to understand Zen teachings you can definitely find them. Zen lineages can be strict and sometimes I wonder if I’d like Huayan more. I would have certainly loved to study with a Huayan teacher if the lineage hadn’t already died out. I think the Zen tradition formed the same way that other religions always seem to, not from one guy looking at a flower. Rather, I think it formed from a slow process of accumulating teachings and being influenced by the other forms of spirituality that were around. Plenty of people will tell you they think the flower and smile story literally happened. I don’t think so, but I think it doesn’t matter. I collected some of the articles I wrote for The Tattooed Buddha and put them into an e-book. If you’re interested in paying for something that you can easily get for free, it’s only $1.99. “Do not commit any non-virtuous actions. This is chanted in a lot of Buddhist temples. To me it’s the shortest possible explanation of Buddhism. People sometimes ask me about Buddhism, mainly because I write about Buddhism on the internet and I have cool Buddhist tattoos (I think). When they do, I like to start by talking about that quote. Some people would start by talking about The Four Noble Truths or the Eightfold Path, or even the story of the Buddha’s life. That quote written above, is direct and to the point. The first two are pretty simple, in fact. Well, they sound simple. That last one sounds a little bit harder, which it is. Do not commit any non-virtuous actions. I’d like to explain this in terms of Sila, morality. In Buddhism we often talk about morality in terms of the Five Precepts (there are lots of lists in Buddhism. Get used to it). 1. Abstain from killing any living beings. These Precepts are not commandments. They’re rules that we observe only because we realize that such actions cause harm to others and to ourselves. 1. The practice of Harmlessness and Compassion. I’d like to explain this in terms of Dana, generosity. This means giving or helping others. This can be done in many ways. We can give kind and encouraging words, we can give someone our time and we can listen to someone who needs it. Of course we can also volunteer our work to good causes and give material charity as well. There are so many ways we can help others. I’d like to explain this in terms of Bhavana, mind cultivation/meditation. 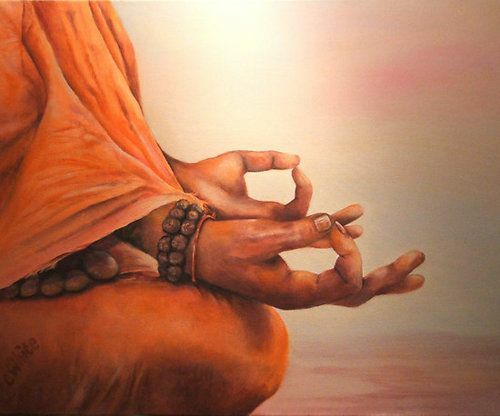 Meditation is said to purify the mind and make it easier to develop generosity, compassion and wisdom. Through deep meditation we can come to fully know ourselves. Through it we are able to really see things as they truly are. Meditation is the form of spiritual practice that led the Buddha to Enlightenment. Even a short meditation, 20 minutes per day, can change your life. This is it—the cultivation of morality, wisdom, and concentration. It seems simple, but of course we can spend all of our lives cultivating these things. This is the simplest and most direct way to explain what Buddhism is all about. “For as long as space endures. For as long as living beings remain. Chants and songs are probably present in all religious traditions. I can imagine shamanic teachers in prehistoric societies leading chants around a campfire. Chanting and Buddhist temples are ubiquitous, right there alongside the incense, bowing, and weird clothes. I’ve found Buddhist communities where they don’t meditate. I’ve never found one where they don’t chant. It’s present in all schools of Buddhism, as far as I know, to greater and lesser degrees; the contents of the chants vary a great deal. We hear chants and songs in other religions and sometimes we see these things as pointless, especially in a Buddhist context. Buddhism, we think, is supposed to be different. In other religious traditions chants and songs are a form of worship. People express their devotion in song. Buddhism is non-theistic. The Buddha doesn’t save us or even transform us. He invites us to transform ourselves. It’s not about worship, so if they aren’t songs of devotion, why would we chant? Sometimes when people first become exposed to Buddhism they really aren’t interested in chanting. The chanting is a tool, I think. It helps us get ready for practice. It serves to provide a doorway out of our regular day-to-day life and into the mystical place of the temple. The purpose is to get our minds ready for the teachings and to help us awaken. This awakening is not intellectual, but a change in how we experience and perceive. Think of mindful chanting as a tool for helping us wake up. I submit that chanting is a part of Buddhism because it’s something human beings value in spirituality. It’s a ritual and rituals motivate and inspire us. Rituals keep us on the path, even if they seem weird or make no sense. Rituals build community too. A big part of chanting and singing is that we’re doing it together. There are several types of Buddhist chants. Some people do believe chants produce some kinds of magical effects. That discussion is beyond the scope of what I want to discuss here. Sometimes we chant things in the original languages and sometimes we chant things in English, like quotes from texts such as the one I put at the beginning of this article. Chanting in a language we don’t understand, I think, makes it feel important or sacred. Maybe it’s more ritualistic and special if we don’t really understand it. OM MANI PADME HUM sounds important to us, and I think all those Ms mean something to us. If we chanted THE JEWEL IN THE LOTUS instead I think it wouldn’t mean as much. Chanting in English obviously reminds us of the intent behind what we’re doing. When we chant things like “May I too remain to dispel the misery of the world,” we are re-dedicating ourselves verbally and generating our intention. I think this does help. It reminds us that this is important and it unites us as a community when we are doing it together. In some branches of Buddhism, like Pure Land and Nichiren, chanting is almost the entire practice. I don’t connect with chanting nearly well enough for that, but plenty of people certainly do. Chanting is one of the things we do in Buddhist temple. The practice would probably feel strange without it. I think it serves a useful purpose. It gives us something to do together, as a community. It happens once in a while to me. Usually it’s anxiety or a tendency to get overwhelmed. Those are my things. I’m a mess. When I was going through my divorce I had to start taking sleeping pills because I was so stressed out and worried that I couldn’t sleep at night. And by that I mean prescription sleeping pills; I had to see a doctor. Gasp! A Buddhist taking sleeping pills?! Sometimes people put big expectations on us when they find out we’re Buddhist. Not often though, most people don’t really know anything about Buddhism. But some people know just enough to misunderstand. I’m not perfect because I’m a Buddhist. I’m not sure why anyone would expect that. We don’t see this in other religions. I haven’t heard anyone say, “You’re a Christian and you’re trying to get rich? !” Gasp! The truth is that Buddhism attracts people who are, in some way or another, broken. The Buddha described his teaching as the cause of suffering and the way out of suffering. That’s called the first turning of the wheel. That’s why the Buddha sat and meditated under the Bodhi tree in the first place. He saw all of the suffering in the world and he decided to seek a way out. That is the spiritual journey. So, Buddhism is attractive to people who are needy, sensitive, and anxious like me. It also attracts the depressed and addicted, the sad and the downtrodden. Buddhism is attractive to people who have seen firsthand what the First Noble Truth is—that life is suffering. In the 1200s Dogen was inspired to undertake the spiritual journey after the tragic deaths of his parents, and just like him, I also was inspired after the tragic deaths of mine. This is not to say that all Buddhists fit this description. There are many things that cause people to enter the path, suffering is only one of them. But I think this is an important thing to be aware of. The lotus flower is a well known symbol in Buddhism. It’s a symbol for Enlightenment. It rises out of muddy water and blooms, becoming clean and beautiful. The mud is our delusion and suffering and blooming is the way we rise above. Without the mud underneath, the flower couldn’t bloom. If we didn’t understand our suffering and delusion, then Enlightenment might be out of our reach. It took me a long time to realize that I am the lotus.